Sometimes a whisper is as good as a shout... But in this case I just want to shout about this book! First – I prefer to be inside my character’s head to properly explore and understand them. I tend to write very introspective characters, and I don’t think that would work so well in third person. I’ve never even attempted second! Do you believe BSL should be learned by everybody? If only! I think it should be more widely recognized and used, especially in schools. It would be great if it could be a language option like French or German. If that were the case, I think hearing people would at least be more aware of it than they are. We should be more deaf aware as a culture. Read on below for more information about this amazing book, my thoughts and a cheeky chance to win a copy! Synopsis: Steffi doesn't talk, but she has so much to say. What I Thought: A Quiet Kind of Thunder is a beautiful contemporary novel that, quite honestly, brought a few tears to my eyes. It is the story of Steffi, a teenage girl who has Selective Mutism. Selective Mutism, like I learned, is not just about choosing when to speak. Coupled with several other illnesses, including anxiety, Steffi seems quite generally scared of life. She doesn't want to be though, and starts the year ready to prove to her family and to herself that she is more and can do more than what her illnesses allow. Teamed up with her boisterous best friend Tem, these two make me wish I had friends like these in school. Back at school, Steffi is introduced to Rhys. Rhys is Deaf and due to her mutism, Steffi can use BSL to communicate with him - sort of. This starts the path to friendship and more, each learning that they are more than what they think they are. Rhys is more than what his Deafness allows, and Steffi has a voice she wishes to use. Rhys is a completely adorable character, and I couldn't help but root for him and Steffi throughout the story. 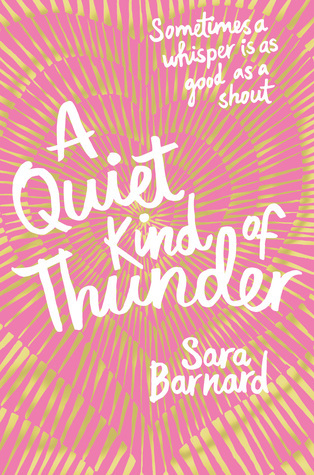 A Quiet Kind of Thunder is a wonderfully written peek into the world of Selective Mutism, anxiety and the Deaf world. It is easy to be a hearing person, not understanding what it is truly like to be a deaf person. Through several different scenarios, Barnard shows what it can be like for a deaf person in the world and the ignorance of hearing people towards the deaf. She also shows what Selective Mutism is like, coupled with anxiety, and how it threatens to drown and swallow a person. This book will open your eyes, and hopefully, make you become more aware of the world around you - and the other worlds that you may not be involved in. First thing I'm doing after writing this? Going to buy Barnard's other book - Beautiful Broken Things! The Good: I love the relationship that Steffi and Rhys had. The explanations of Selective Mutism and the look inside the deaf vs hearing world. The Bad: The story had a slow build up, and was fairly easy to gather where the story was going. Want a chance to win this amazing book? Enter below!